With textured slip resistant rubber grip. Shaft and grip combine to dampen the impact transmitted through to the user’s hand and wrist. 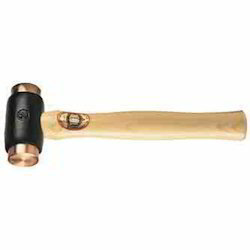 Reduces operator fatigue and the risk of RSI (Repetitive Strain Injury).The high strength of the shaft and head bond make the hammer virtually unbreakable. 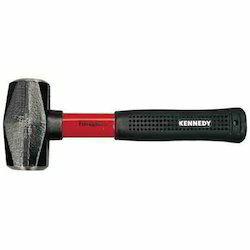 Kennedy soft-faced hammers have composite material striking faces that DO NOT have any metal in them that would mark the surface of the work piece. They are a safer alternative for striking machined surfaces than conventional steel hammers that would damage the surface. The impact-resistant composite material striking face shapes itself to the component being struck, minimising rebound damage to the component and reducing noise pollution in the work place. Kennedy inside the hollow die cast aluminium hammer head are thousands of steel pellets which impact a split second after the hammer face, reducing rebound whilst also adding to the force of the blow. Each hammer has two replaceable screw-in nylon hammer faces that can be easily replaced when they become worn, without the use of any other tools - minimising down time. The striking faces are reinforced for extra strength and to prevent fracturing from off centre strikes. 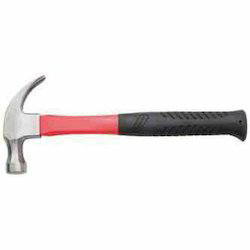 The nylon hammer faces have a precision moulded screw thread that screws securely into the single piece die cast aluminium hammer head, the handle is a high strength girder section that has a shock absorbing soft dual material grip, for improved grip and control. Malleable iron head with two pure electrolytic copper faces, for high impact blows. Solid wooden handle. We are mainly looking for Hydraulic Jacks,Impact Wrenchand pneumatic tools queries. 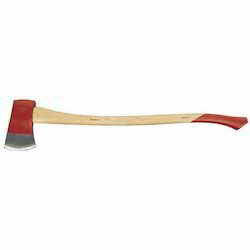 Felling Axe Suitable for felling small trees, chopping off branches and splitting logs. High quality tool steel blade, polished and lacquered.Finely sanded hickory handle, shaped for maximum user comfort. Part painted head and handle for durability.900mm hickory shaft. 21/2 x 3/4 eye.